Ringworm - body, causes, Keyword, What Are the Signs and Symptoms of Ringworm? Ringworm is a fungal infection of the skin, scalp, or nails. Ringworm is not caused by a worm! Ringworm is a common fungal infection that can occur on any part of the body. The name comes from the appearance of the infection on the skin, which is usually ring shaped with a raised reddish border. Ringworm is caused by both direct and indirect contact with infected people, animals, or soil. 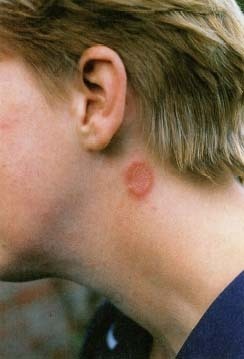 The medical term for ringworm is tinea. The red circular rash behind the ear is an example of ringworm of the body, or tinea corporis. John Hadfield, Science Photo Library/Photo Researchers, Inc.
Ringworm of the foot is called "athlete's foot" or "tinea pedis." Ringworm of the groin is called "jock itch" or "tinea cruris." Ringworm of the scalp is called "tinea capitis." It usually starts as a small pimple-like sore before spreading as a fine, scaly, bald patch. It may cause hair to become brittle and to break off, and it may be spread by sharing hats or combs. Ringworm of the nails is called "tinea unguium." It usually affects one or more nails of the hands or feet. The infection causes the nail to thicken and to become discolored and brittle. Ringworm of the body is generally called "tinea corporis." How Do Doctors Diagnose and Treat Ringworm? Ringworm is relatively easy to diagnose and cure. The doctor may perform a simple test for the presence of a fungus. Treatment usually consists of applying an antifungal cream for about two weeks or taking prescription medication by mouth for two to four weeks. Treatment of nail infections is usually more difficult and takes longer. Ringworm is easily spread from one person to another, so it is important to follow the doctor's instructions, to launder clothes and bedding frequently, and to maintain good personal hygiene. what is the best way for me not to past it on to somebody?